Tropical DHA-Free Natural Bronzer provides streak-free/stain-free results. Jamaican Black Castor Oil Unblocks clogged pores while detoxifying, removing excess oil in skin and working as an anti-inflammatory. Coconut Milk & Vitamin E Silky-smooth skin softeners deeply penetrate to hydrate skin. MelanoBronze & Melactiva Stimulates melanin activity to allow for longer lasting, darker tanning results. Advanced Matrixyl Synthe 6 - Tightens and tones the skin while helping to fight the formation of wrinkles. Argan Oil softens the skin. Hemp seed oil adds superior hydration to the skin. If you crave sunshine kisses and summertime wishes, then escape to the tropics with Caribbean Cool . 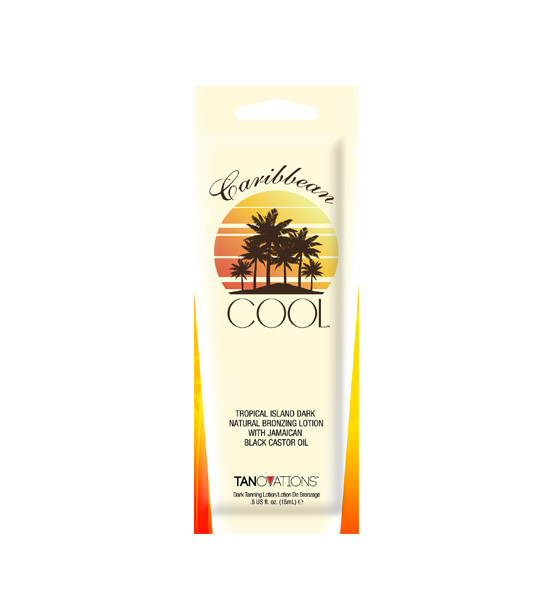 This natural bronzing formula will impart streak-free island dark results while also utilizing Caribbean skin care staple, Jamaican Black Castor Oil. You will slow down the signs of aging, help unblock clogged pores as well as soften and hydrate with the lushest levels of Vitamin E. If you dream of salt air in the middle of nowhere, then ride into the sunset with Caribbean Cool . Paradise awaits!